Our Zero-Till Seed Drill Machine is design to save time, fuel and irrigation expenses. 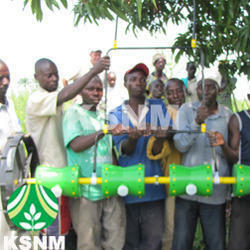 It is an agricultural implement used for sowing per-germinated paddy seeds directly in wet-land field. It is a manually pulled implement which helps the farmer to sow 8 rows at one draw. It does not require any mechanical power for its operation. - It is an agricultural implement used for sowing pre-germinated paddy seeds directly in wet-land field. It is a manually pulled implement which helps the farmer to sow 8 rows at one draw. It does not require any mechanical power for its operation.